Xabi Alonso and Sergio Ramos have been accused of picking up bookings on purpose on Wednesday to miss a pointless trip to Galatasaray, but what can be done to stop this phenomena? It was in the 73rd minute of the Champions League quarter-final first leg that Gonzalo Higuain’s flicked header put Real Madrid 3-0 up against Galatasaray and effectively left the Turkish outfit with no hope of progressing to the last four. But, for many, the big news to come from the clash at the Santiago Bernabeu came in the 17 minutes which followed the Argentine’s goal. With six minutes left, Nordin Amrabat was body-checked by Michael Essien, prompting a yellow card for the Ghanaian. 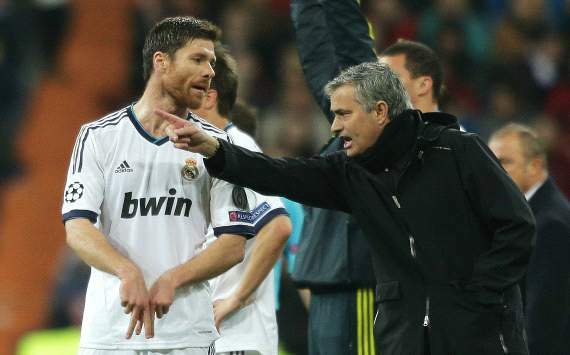 Xabi Alonso’s response was to react with undue insult towards referee Svein Oddvar Moen, earning him a booking which rules him out of the second leg in Istanbul. Then, in the final minute, Alonso got a piece of Emmanuel Eboue’s heel as the full-back approached the Madrid area. When Moen awarded the visitors a free-kick, Sergio Ramos belted the ball away in frustration, leading to a caution which meant he too will stay at home next Tuesday. The world’s reaction was to claim that the two players had deliberately sought out yellow cards that would keep them out of the dead rubber against Gala, and wipe their slates clean ahead of the semi-finals. The charge levelled at Alonso and Ramos is not a new one. In November 2010, the same pair were caught up in controversy when they were both sent off late on in a 4-0 win at Ajax on matchday 5, ruling them out of the final group match with Madrid already qualified. Again, they sat out meaningless games and had a full, clean licence come the knockout phase. On that occasion, they were both handed fines by Uefa, along with coach Jose Mourinho, who had involved substitute Jerzy Dudek and goalkeeper Iker Casillas – the shot-stoppers also later being fined – in an elaborate but obvious string of Chinese whispers moments before the players’ second yellow cards. It wasn’t the first time players had been hit in the pocket. Olympique Lyonnais duo Cris and Juninho Pernambucano were fined €15,000 and €10,000 respectively in 2008 for deliberately earning yellow cards against Fiorentina, also in the Champions League. The question brought up by Del Bosque as to the unsportsmanlike nature of the bookings undoubtedly deserves some scrutiny, but there is a point of law to be considered in the latest case. Whereas in Amsterdam a fairly clear conspiracy had been hatched in order to release both players of their accumulated cards, there was no such evidence on display against Gala on Wednesday. And without reasonable proof that the yellow cards were deliberately provoked, Uefa does not really have any right to do anything other than uphold their own laws and ban the players for the second leg. Whether there has been a premeditated intention of wrongdoing cannot be argued easily without trouble following. When Kevin Moran became the first ever player to be sent off in an English FA Cup final for Manchester United against Everton in 1985, TV pundit Jimmy Greaves claimed that referee Peter Willis had dismissed the Irishman simply because it was his final game as a senior official and he wanted to go out with a bang. Willis successfully sued Greaves, setting the kind of precedent that could easily be mirrored should Uefa try to punish Ramos and Alonso with repeat fines. The deliberate booking has been a tactic of many players for several years. Former England captain David Beckham even once boasted that he had been clever in picking up a yellow in a World Cup qualifier against Wales to miss a trip to Azerbaijan that he was already due to skip after breaking a rib moments earlier. So often do those sitting on the verge of a suspension collect a yellow card that it is almost expected nowadays. Indeed, had Arturo Vidal decided to force the referee to caution him late on in the first leg of Juventus’ Champions League last-16 clash with Celtic with his side 3-0 up, he would have missed a straightforward home game with progress already practically assured. Instead, he remained honest, and will subsequently miss a vital return fixture against Bayern Munich having been booked in the Bianconeri’s 2-0 defeat at the Allianz Arena on Tuesday. So, under current regulations honesty doesn’t always pay, but there appears little other option available to the authorities without treading a very fine line legally as they attempt to decide who might be thinking what and when in the dying minutes of matches preceding missable fixtures. Until a solution of some sort can be found, tactical bookings will continue to be a part of the game. As long as the yellow cards are for dissent and pettiness rather than dangerous challenges, are they really doing any harm? Perhaps not, except to the increasingly diminishing integrity of the sport we love. This entry was posted in Club news on 05/04/2013 by mirsinho.